It may be cold and gray outside but at least citrus fruits are in season to bring some color and brightness to our lives. My grocery store is celebrating what they call “Citrus Fest” this week and the produce section was awash with cheerful colors from all the varieties of oranges, lemons, limes, and grapefruits on display. 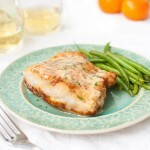 So, what better time than now to post this recipe for pan fried fish with citrus butter sauce. The fresh grapefruit, orange, and lemon juices in the sauce add a punch of flavor that shakes up the typical butter sauce. In fact, when you taste the sauce on its own you may think it has a little too much punch. Don’t worry though. The extra zesty flavor gets balanced out when served with the fish. I tried two different ways of cooking the fish. One was simply to season the fish, dredge it in flour, and then pan fry it. Though that method was good it lacked a little something in flavor and texture. Remembering a similar dish my husband enjoyed recently at a seafood restaurant, he suggested coating the fish in a light batter and then pan frying it. That method was the clear winner. The light coating soaks up the sauce nicely and carries the flavor through the entire dish. It’s definitely worth the extra step. Combine wine, grapefruit juice, orange juice, lemon juice, vinegar, shallots, and bay leaf in a small saucepan. Boil mixture over medium-high heat until it is reduced to about 1/3 cup, 15-20 minutes. Add cream and boil until mixture is reduced to 1/3 cup again, 1-3 minutes. Discard the bay leaf. Reduce heat to low and whisk in butter 1 piece at a time, adding the next piece of butter before the previous one has completely melted. Lift pan off heat as necessary to keep sauce from getting too hot if butter begins to melt too quickly and the sauce separates. Once all the butter is mixed in, stir in parsley. Season the sauce with salt and pepper to taste. Set the pan over a saucepan of warm water, stirring occasionally, to keep the sauce warm while cooking the fish. Don’t let the sauce get too hot. Make the egg batter by whisking together the eggs, milk, and a pinch of salt in a cake pan or pie plate. Set aside. Pat fish fillets dry with paper towels and season on both sides with salt and pepper. Put the flour on a plate. Coat each fillet lightly with flour on both sides, shaking off any excess flour. Then submerge the fish fillets in the egg batter. Turn the fish to coat both sides evenly. Pour about 1/4 inch oil into a large non-stick skillet. Heat oil over medium-high heat. When oil is shimmering, lift the fish from the egg batter one piece at a time, allowing excess batter to drip off, and carefully add fillets to skillet. Cook, until golden brown and crisp on the underside, about 5-7 minutes. Turn and continue cooking until golden brown and crisp on the second side, 3 to 5 minutes more depending on the thickness of the fillet. Drain fish fillets on paper towels. To serve, place a fillet on a plate and spoon some of the citrus butter sauce over the fish. Recipe for sauce adapted from Gourmet Magazine, February 2006. Recipe for fish adapted from New York Times.